Neck pain is common but most cases aren’t caused by a serious problem. Most cases of neck pain get better on their own within a few weeks. 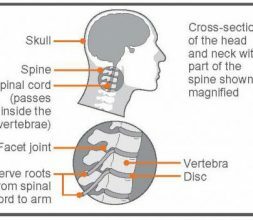 Your neck, or cervical spine, is made up of the seven smallest vertebrae, and it’s subject to the same stress as your backbone. Stay active. Bed rest for more than a couple of days makes it harder to get going. Gradually increase your normal activities and do regular exercise. Take painkillers if needed so you can stay active. Your pain should ease within 2 weeks and you should revocer over approximately a 4-6 week period. If you have severe neck pain or weakness in your arms/hand you need to contact your doctor. You should use the suggested exercises bellow at least 6-8 weeks to help prevent symptoms returning. 1. Neck stretch: keeping the rest of the body straight, push your chin forward so your throat is stretched. Hently tense your neck muscles and hold for 5 seconds. Return your head to the center and push it backwards, keeping your chin up. Hold for 5 seconds. Repeat 5 times. 2. Neck tilt (side to side): Tilt your head down towards your shoulder , leading with your ear.Gently tense your neck muscles and hold fot 5 seconds. Return your head to center and repeat on the opposite side. Repeat 5 times on each side. 3. Neck tilt: Tilt your head down to rest your chin on your chest. Gently tense your neck muscles and hold for 5 seconds. Return to a neutral position and repeat 5 times. 4. Neck turn: Turn your head towards one side, keeping your chin at the same height and moving within comfortable limits. Gently tense your neck muscles and hold for 5 seconds. Return your head to the center and repeat on the opposite side. Repeat 5 times on each side.